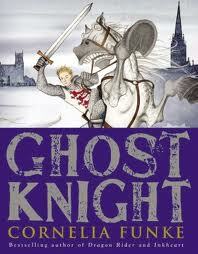 Ghost Knight, by Cornelia Funke (Little Brown, May 1 2012, middle grade). When 11 year old Jon Whitcroft is packed off to boarding school in Salisbury, England (a consequence of having made himself utterly disagreeable to his mother's boyfriend, aka "the Beard"), he is naturally hurt and angry. But soon Jon realizes that boarding school will bring a more pressing problem that will make the possibility of a new stepfather the least of his worries. And it's not the boarding school food, the close quarters, or the boring drone of his teachers. Nope. Jon's new problem is a ghostly medieval warrior, Lord Stourton, who wants to kill him. Turns out Jon's ancestor was instrumental in getting Stourton hung (deservedly) back in the 16th century...and revenge is still sweet 500 years later. Jon's classmates and teachers can't see this murderous ghost and his horrible henchman. But one person believes him--a girl named Ella, who has grown up with the ghosts of Salisbury. She leads him to the tomb of the one ghost who might help him--William Longspee, a knight from the 12 century who must atone for his own wrongdoings by helping those in need. But can Longspee truly be trusted? He did some terrible things in life himself...and possibly in death as well. Faced with the vivid possibility of death at Strouton's ghostly hand, Jon and Ella have little choice--they must call Longspee to aid them. Or else. It's a zipping, ghost-filled story. There are moments that made hair on the back of my neck stand on end, in perfect spine-tingly fashion, and I can imagine young readers utterly on the edge of their seats once the threat of ghostly violence enters the picture! There's a bit of a mystery to be solved, which takes some breaking of school rules on the part of Jon and Ella, and quite a bit of exploring Salisbury and environs (including Stonehenge and the must-visit ruins of the castle of old Sarum. 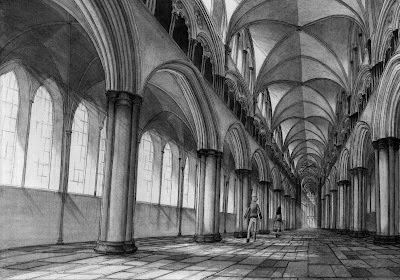 There are also lovely descriptions of Salisbury cathedral, which is a lovely place to visit too). And on top of that, it's a story of friendship (Ella's and Jon's, which maybe kind of might end up with young love in a very believable way), and coming to terms with unasked for and unwanted changes in life ("the Beard" turns out to be Ella's uncle, and not nearly the totally black villain Jon had painted him as). Sure, Jon's happy acquiescence at staying at boarding school at the end of the book might seem a tad abrupt, but Ella is there to sweeten the pot...I liked Ella lots--she's a strong-minded, free-thinking type, and she makes a good friend. And that's about the extent of the time travel...I wish there had been more! I am also faced with slightly conundrums regarding other categories--it's a boarding school story, which is part of the point, but not nearly THE point, and it's historical fantasy-ish, in that the events of the past are a large part of the narrative, so you almost feel that you've read historical fiction, but it's not actually set in the past, so I don't think I can count it...at least I can label it with certainty "book with ghosts." Other thoughts can be found at Ms. Yingling Reads; if you've reviewed it, let me know and I'll add you! I love Cornelia Funke. That's awesome you got an ARC. I'll definitely have to check this out. Yes, do--I think you'd like it! Oh, we went on a rainy day in January and there was virtually no one else there! Just some sheep. It was magical. I was afraid it would be so disappointing--just a ring of stones, and a lot of crowds--but just the other day Elliot told me he liked it better than the Colosseum, which is saying a lot. Maybe next time we can all meet up in England! Great review - very much looking forward to reading this, especially since I live close to Old Sarum.